High-dimensional datasets, where the number of measured variables is larger than the sample size, are not uncommon in real-world biomedical applications such as brain connectivity modeling using functional Magnetic Resonance Imaging (fMRI) data. Conventional statistical signal processing tools and mathematical models could fail at handling such high-dimensional problems, and developing efficient algorithms for high-dimensional situations are of great importance. This talk mainly focuses on the following issues with application to fMRI brain connectivity modeling: (1) recovery of sparse regression coefficients in linear systems, here we focus on the Lasso-type sparse linear regression; (2) estimation of high-dimensional covariance matrix and precision matrix, both subject to additional random noise; and (3) error-rate controlled brain connectivity modeling. Z. Jane Wang received the B.Sc. degree from Tsinghua University, China, in 1996, and the M.Sc. and Ph.D. degrees from the University of Connecticut in 2000 and 2002, respectively, all in electrical engineering. She has been Research Associate of Electrical & Computer Engineering Department at the University of Maryland, College Park. Since Aug. 1, 2004, she has been with the Department Electrical and Computer Engineering at the University of British Columbia, Canada, and is currently a full Professor. Her research interests are in the broad areas of statistical signal processing theory and applications. 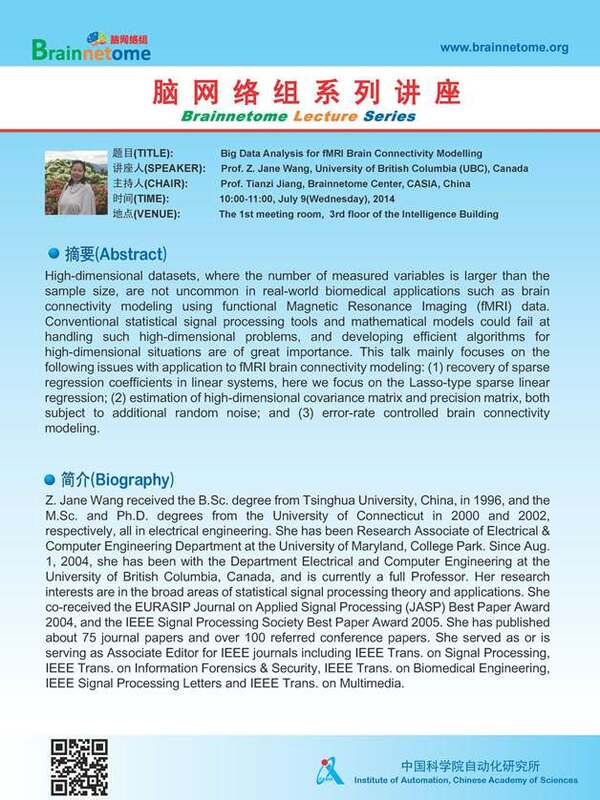 She co-received the EURASIP Journal on Applied Signal Processing (JASP) Best Paper Award 2004, and the IEEE Signal Processing Society Best Paper Award 2005. She has published about 75 journal papers and over 100 referred conference papers. She served as or is serving as Associate Editor for IEEE journals including IEEE Trans. on Signal Processing, IEEE Trans. on Information Forensics & Security, IEEE Trans. on Biomedical Engineering, IEEE Signal Processing Letters and IEEE Trans. on Multimedia.